I'm so excited to have Christine here from Bun & Borough providing us with the perfect Road Trip Playlist. 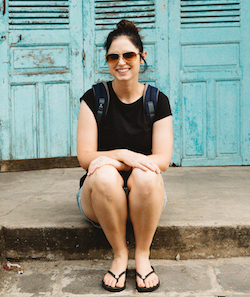 Christine's blog has long been one of my favorites and I love her upbeat outlook on life and reading all about her adventures as a recent college grad. She posts on everything from Food to Fashion to Running and her posts never fail to provide me with a healthy dose of inspiration. Thanks so much for this incredible playlist Christine! Hi guys! Christine here from bun&borough to deliver an AWESOME and the ULTIMATE road trip playlist for Jenna! Jenna is so so sweet, and is one of my favorite blog ladies. How cool are road trips? Not only do I love traveling, but I love the actual traveling it takes to get to wherever you're going (yes I am one of those crazy weirdo people who look forward to bus rides and 10+ hour plane rides!). It's the anticipation that makes the ride so exciting, and the music you listen to along the way is definitely a part of getting you pumped up! So let's get at it... introducing the Road Trip Playlist. 1) Teenage Dream :: Katy Perry | Such a good song, no? I'm 23, but can still relate to the butterflies feeling! Also, the music video is all about a road trip. Perfect! 2) Live Like We're Dying :: Kris Allen | We only live once! Make every moment count for something! Even on the road! 3) Back Where I Come From :: Kenny Chesney | LOVE KENNY. For all of you country fans out there, and for everyone who has rediscovered their roots and their hometowns. 4) Someday :: Rob Thomas | This one's underestimated. It's deep. 5) Shark In The Water :: VV Brown | What a feel-good song! 6) Airplanes :: B.o.B | Reminds me of driving down to Cape Cod with my college friends to spend a week at the beach having a blast! 7) Hold My Hand :: Hootie and the Blowfish | A spring and summer favorite. 8) Lookin' For a Good Time :: Lady Antebellum | A good sing-a-long song. 9) The Show Goes On :: Lupe Fiasco | My newest pregame pick! 10) Feels Like Today :: Rascal Flatts | This one just makes me so happy and all smiley. Thanks for having me guest post, Jenna! Love this post. Road trip playlists are the best, and I love that yours includes some country! Katy Perry's Teenage Dream is also a favourite of mine. I adore that Kenny Chesney song! Yes, yes, such an upbeat playlist you got here. It's more than just perfect for long road trips. These are the types of songs that you're gonna love singing along to. A good mix of country and mainstream, I would say.